Tasting the Middle Eastern and Mediterranean flavors of O'Falafel. I’m not quite sure why it’s taken me this long to get around to writing about O’Falafel Etc. I’ve loved this Sugar House eatery since it opened in 2008. Maybe subconsciously I just wanted to keep it to myself. Mea culpa. The restaurant is owned and run by Mustafa and Osama Khader, who are originally from Jerusalem. Mustafa studied culinary arts in Switzerland and does most of the cooking, while Osama handles the business side of things and is often found out front, greeting and chatting with customers. The menu is extensive, running the gamut from hummus, tabbouleh and falafel to flatbread pizzas, kebabs and entrees such as mousakka, makhshi, yakhni khudra and vegetarian okra. 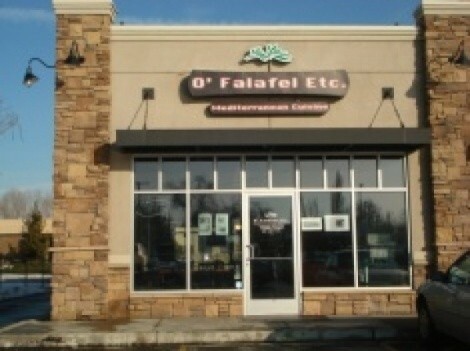 All of it is very reasonably priced; you get a helluva bang for your buck at O’Falafel. Customers order meals at the walk-up counter, and are given a number to place on their tables; the food is promptly delivered. If you’re lucky, you’ll encounter a vivacious, peppy server-cashier named Natalie, who radiates sunshine and good vibes throughout the restaurant. She’s well-versed in the Middle Eastern menu and is at the ready with good recommendations and information about the exotic food options. A good starting point is to select one of the appetizer samplers, which give you a choice of four, six or eight samples from the appetizer menu for $8.95, $9.95 or $10.95, respectively. The four-sample plate we chose during one of our visits easily could have served as a complete, satisfying meal. It was an order of hummus, two falafel patties, a serving of foul and four stuffed grape leaves. I liked the texture and overall taste of the hummus (pureed garbanzos and tahini) and its slightly lemony flavor, although I thought a tad more garlic was in order. The stuffed grape leaves were delicious: white rice, onion, parsley and tomatoes wrapped up in grape leaves and served cold, seasoned with olive oil and lemon. Of all the appetizers at O’Falafel—and I’ve tried most of them—my favorite is foul: pureed fava beans with a lemon, pepper, parsley and garlic sauce, all topped with smashed garbanzo beans. The foul is delicious all by itself, but even better when mopped up with O’Falafel’s soft, airy pita bread, which is made fresh daily. To my knowledge, this is the only Middle Eastern restaurant in Salt Lake City that bakes it own pitas. I like the flavor of the falafel, too, although I think it gets fried a tad too long, making it a little too crunchy. The falafel consists of oval patties of ground garbanzo beans seasoned with a hint of onion, parsley and cilantro. The best falafel I ever sunk my teeth into was at a tiny place about the size of a walk-in closet in New York City’s Greenwich Village, called Mamoun’s. I ate a truckload of 75-cent falafel sandwiches there while in graduate school. O’Falafel serves the same red chili sauce condiment that Mamoun’s did—an unadulterated chili sauce made with no additives like garlic or other spices—which I’d never seen at another falafel joint until now. I asked Osama about the chili sauce and mentioned that I hadn’t seen it since I was in the Big Apple. “Was it at Mamoun’s?” he asked me. Turns out Osama used to live in New York City and is familiar with Mamoun’s, the oldest falafel restaurant in the city. And the sauce is called Sambal Oelek, which I believe is made in Indonesia. I do wish, however, that the falafel at O’Falafel was a little more like Mamoun’s: less crunchy. Mamoun’s falafel came from the fryer soft and moist enough to be able to smear onto warm pita bread, rather than as crisp, dry, crunchy nuggets. And, it was served with tahini sauce, which O’Falafel’s isn’t. Still, the flavor of O’Falafel falafel is just right. One of the most appealing entrees is makhshi ($10.95), which is baked eggplant served on a plate of plain basmati rice, smothered in a tangy tomato-yogurt sauce and topped with browned ground beef, pine nuts, onions and parsley. Of course, as with most everything at O’Falafel, it comes with a generous portion of that yummy fresh-baked pita alongside. Another of my O’Falafel favorites is kifteh, Turkish meat patties that are sort of like mini meatloaves. They are small, thumb-size cylinders of minced beef mixed with parsley and onions and seasoned with Mediterranean spices; I tasted cumin, allspice and a hint of nutmeg, I think. The kifteh is grilled and served as a sandwich in a pita pocket ($6.95) or as an entrée ($10.95) with basmati rice pilaf, tomatoes, onions, mushrooms and steamed veggies, with a yogurt-cucumber-mint sauce on the side. Once you try kifteh, mom’s meatloaf might not stack up too well. It would be nice to be able to drink a beer or wine with these Middle Eastern/Mediterranean flavors, but you’ll need to settle for fountain drinks, tea or coffee. Not that that’s necessarily a bad thing. O’Falafel serves authentically potent Turkish coffee ($2.95), brimming with the flavor of cardamom. For dessert, it would be foolish to pass up the homemade ice creams: mango, coconut or pistachio, each with a hint of fragrant Mediterranean sahlab. The pistachio, in particular, is the bomb! I’d need another 1,000 words to do justice to the remaining three-quarters of the menu that I didn’t cover here. So, I suggest you discover those dishes for yourself: fatoush, baba ghanouj, shwarma, lahmeh wa a’jeen, majadareh, mena’ish za’atar. These and much more, including the friendliest of faces, await you at O’Falafel Etc.